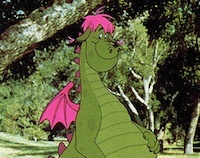 Walt Disney Pictures has plans to remake their 1977 live action/animation hybrid Pete’s Dragon. Deadline reports that the studio has brought aboard Ain’t Them Bodies Saints writer/director David Lowery and his writing partner, Toby Halbrooks, to provide the screenplay. The original film followed Pete, a young orphan boy with an imaginary friend, Elliot, who just happens to be an enormous animated dragon. Ain’t Them Bodies Saints, set for release on August 16 through IFC Films, marks Lowery’s first feature as a director although, at this time, he’s boarding Pete’s Dragon strictly as a writer. Although the 1977 film was a musical, it is noted that the new version is not being planned as one.